The crow is in the drama. The crow is the grief. He almost has a cockney lilt to his banter. Dad is coping, the twin boys are romping, the bird is the manifestation, the reality. It is poetry as prose, contained within a novel-like context but the crow has wings and can take us to other dark parts of the netherworld, as in his bad dreams. Rather nicely, Porter, who has been a Granta editor as well as a bookseller himself, offered the work to Hughes’ publishers Faber. Luckily Hannah Griffiths at Faber got it straight away and they have produced an edition worth the keeping. “On the left we have the dad. This image occupies the functional position of the here-goes, the ask, what I like to call the George Dyer-on-the-shitter, the left flank, the hoist, the education spot, the empty church, the torture step, the pain panel, the muscular”. It repays re-reading a few times. And more. 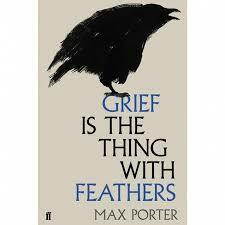 This entry was posted in 101greatreads, fiction and tagged crow poems, faber, grief is the thing with feathers, hannah griffiths, max porter, ted hughes. Bookmark the permalink.